Usually I have some destination in mind before I depart on a flight, which is pretty much required for proper flight planning, but today I took off with only the objective of testing my headsets. Along the way I ended up landing at an airport I had never visited before and flying higher than I ever had in a light plane. As a result of a burglary back at the beginning of the year, I have an odd collection of aviation headsets: an original Lightspeed Zulu, a Lightspeed Zulu.2, and a Lightspeed Sierra. I use the Zulu.2 all the time, but I have not really checked out its Bluetooth connectivity with my iPhone, which can be used to listen to music and to make phone calls. The original Zulu and Sierra are used by passengers, and both were reportedly having problems. 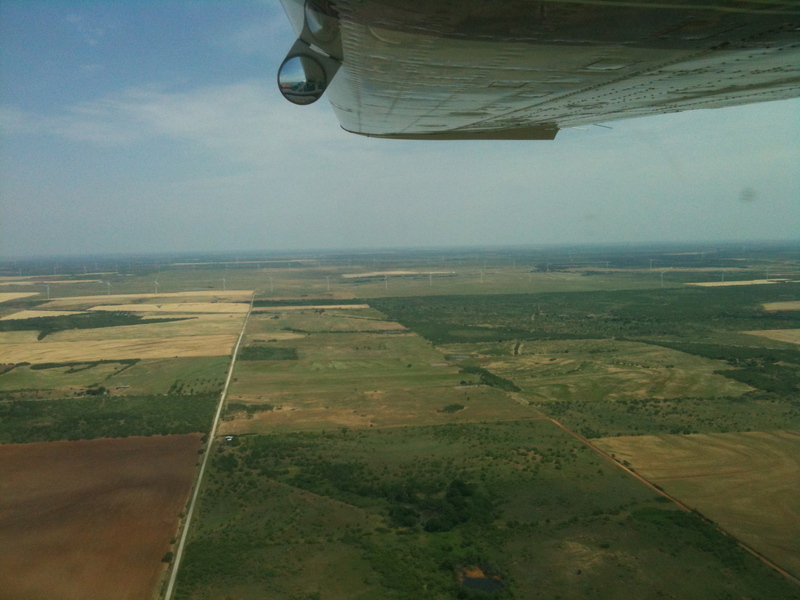 Even though I did not have a particular destination in mind, I knew I would probably head west from Fort Worth since the winds aloft were out of the west, and I prefer to fight headwinds on the way out instead of the way back. So I did my flight planning with that in mind. No TFRs and no bad weather anywhere close, so it looked OK.
After takeoff from Meacham, I headed west and started playing with the Bluetooth connection on the Zulu.2. The headset and iPhone had been previously coupled, and turning on the Bluetooth radio on each was it all it took to get them talking again. After that, all it took to get music to stream from the iPhone to the Zulu.2 was to play it on the iPhone. The iPhone shows a menu that lets you select where the audio should go: Bluetooth device, iPhone speakers, or iPhone headset output. With that, the sounds of Mele O Hawaii accompanied the rest of my flight. The sound quality was very good, but at first the music seemed to cut out at random intervals. Thinking it might be a connectivity problem, I placed the iPhone in various places around the cockpit to see if it made a difference. Nope. The Zulu.2 automatically interrupts the music whenever there is a transmission over the radio so the music does not interfere with important communications. That is a good thing. Today was a nice day for flying and many people were out enjoying the day. My radio was tuned to a Unicom frequency used by many airports, so every time someone would transmit at one of these airports it would interrupt the music. Some of the transmitting planes were so far away I could not hear them, but the radio was picking up some signal, causing the music to be interrupted. So, if you are on a busy frequency listening to music would be a problem. Again, that is a good thing. The Zulu.2 Bluetooth connectivity was working fine, so it was time to test the other headsets, starting with the original Zulu. This was my old headset. It was stolen from my home during the Christmas holiday and then recovered by the police in February. When I got it back it had been drawn on with some sort of red marker and it reeked of cigarette smoke, but it seemed to work fine. However, the last time a passenger used it they said they thought the microphone only worked intermittently. I plugged the old Zulu into the passenger headset jacks and put it on my head. Noise canceling was working fine and transmitting worked fine too. The passenger problem was probably not keeping the microphone close enough to their mouth. It has to stay right next to the mouth to overcome all the ambient noise in the cockpit. So the result was good. No problem with the old Zulu. However, it seemed like the old Zulu was actually a little quieter than the new Zulu.2. Could that be? I tried switching them back and forth several times, but the cockpit is so loud without headphones, and the brief blast of noise when changing headsets made it hard to make a direct comparison. (How did we fly in the old days without headsets? Seems crazy now.) The Zulu.2 has different ear seals with a reduced padding area to let eyeglass temples pass through without putting additional pressure on the side of your head. Makes them more comfortable, but maybe it is letting a little more noise in too. I could not tell if the old Zulus were really quieter than the Zulu.2s, but I did find that pushing the Zulu.2s against my head made them quieter and they stayed more quiet even after I released the pressure. I’ll have to start doing that now every time I put them on. The last test was the Sierra headset. It was purchased as a replacement for the two Telex headsets I had stolen, so it is new. When I first brought it home it would make a loud squealing noise whenever the noise-canceling was turned on. I sent it back to Lightspeed for repair, and it worked great when it came back from them. However, a passenger had reported hearing a loud noise when the noise-canceling was turned on again, so it was time to check it out. I unplugged the old Zulu headset and plugged the Sierra in to the passenger jacks. I put it on and at first left off the active noise reduction (ANR). The Sierra is lighter than either of the Zulus, but its passive noise reduction was not as good either. It is noticeably louder than the Zulu when both are in passive mode. I turned on the ANR, and as expected it got a lot quieter – and no squealing. I tried various ways to make it squeal, lift off one ear and then the other, push on both sides, push on one side and then on the other, but it would not squeal. It is working fine now, and I hope it stays that way. By this time I was approaching Jacksboro. 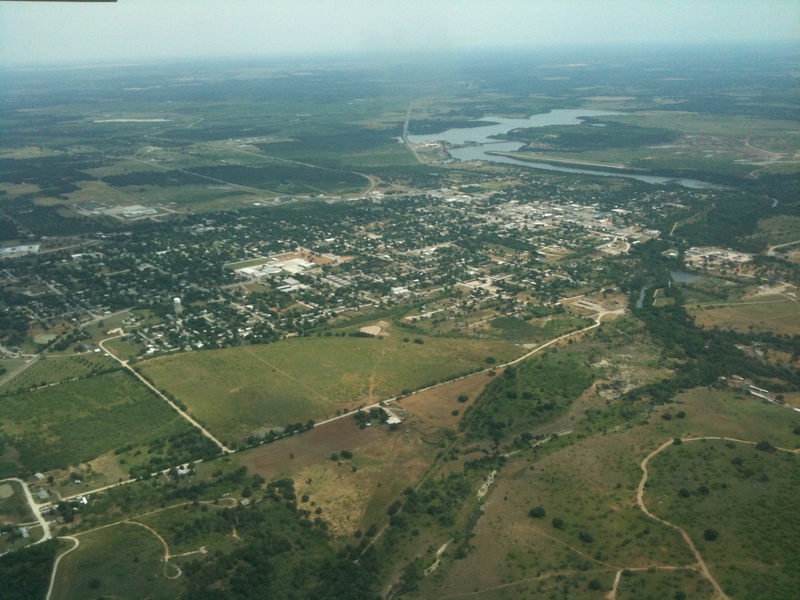 Jacksboro, Texas. Its airport is just on the other side of the lake on the right side of the picture. I looked at my chart to see what was interesting around here and saw that Olney, Texas was not too far away. Olney is home to Air Tractor, the world’s largest manufacturer of agricultural and firefighting aircraft. I met the president of Air Tractor, Jim Hirsch, at Texas A&M University’s aerospace engineering senior design review last week, and it sounded like a very interesting company. You don’t expect a world leading company to be located in a small west Texas town, but there they are. So off to Olney I went. Olney is not hard to find from the air. Just look for the windmills. 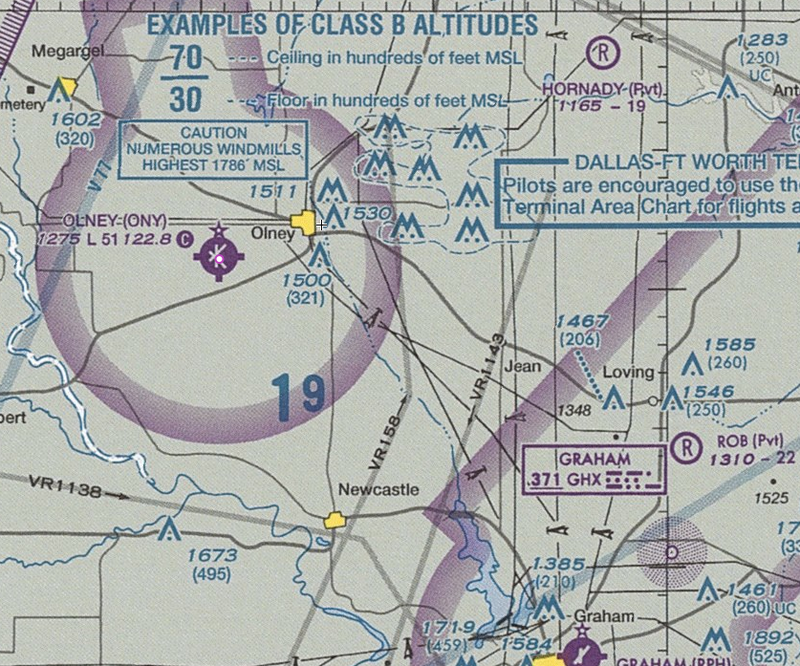 Olney on an aviation sectional chart. Note the caution about windmills. The upside down V’s and W’s are windmills. Wind farm located just east of Olney. Olney was pretty quiet on this Sunday afternoon, so I did a touch and go and headed back to Fort Worth. I was not in a particular rush to get back to Fort Worth, so I decided to see how high the Cardinal could climb. There are various limits on how high an airplane can fly. Its service ceiling is defined as the altitude at which its climb rate drops off to 100 feet per minute (fpm), but there are other limitations. 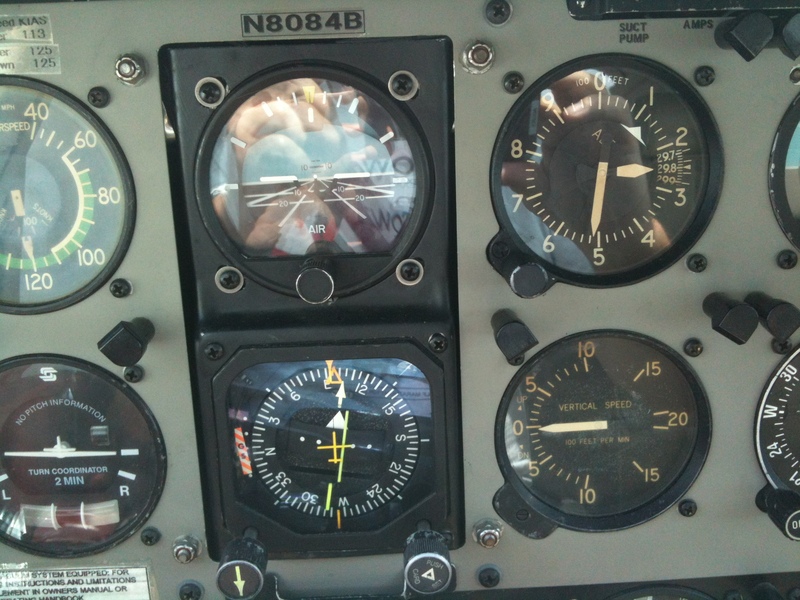 All flights above 18,000 feet have to be on instrument flight plans, so an airplane needs to be IFR capable to fly above that and there are other limitations related to aircraft instrumentation and equipment at other altitudes above that. The service ceiling on the Cardinal I was flying is 17,100 feet. No way was I going to be able to go that high. First, federal aviation regulations require pilots to use oxygen above 14,000 feet or when above 12,500 feet for more than 30 minutes. So, I could go to 14,000 feet as long as I get from 12,500 feet up to 14,000 feet and back down in less than 30 minutes. In the end, I got bored with climbing and stopped when I reached 12,500 feet. at that point my climb rate was about 250 fpm so going up to 14,000 feet and back down to 12,500 feet could have been completed in well less than 30 minutes. I think 17,100 feet would have been possible too, if I had an oxygen system, even though the temperature was much warmer than standard. Of course, I was well below gross weight too. Altimeter showing the Cardinal at 12,500 feet. The top of the climb was just north of Mineral Wells, so it was a nice long descent back into Fort Worth from there. No particular place to go, but still a good time. Just finished Daniel Suarez’s Freedom(TM), the sequel to Daemon, which I reviewed here. The story picks up right where Daemon ended, but this book is more of a political story than a gaming and technology story. Like Daemon, this is a fast-paced story and has enough realistic twists to keep you thinking, but as in Daemon there is not a lot of character development. That’s OK. It is still a great story, and I recommend it without qualification. I’ll talk more about the storyline below, and there may be a few plot spoilers, so if you have not read Freedom(TM) you might want to stop here. In this second book in the series, the Daemon gradually transitions from a malicious force of evil to an apparent force for good as the real bad guys emerge – government contractors! Hey, I have seen enough examples of bad government contractors to know they can be frustrating, but the frustration is usually caused by their ineptness and not their all-powerful competence that puts them in the position of being the real government power. As Freedom(TM) progresses, the contractors have elevated themselves to positions of power and elected officials and government employees are made irrelevant. I guess that is the reason for the trademark symbol in the title. The major struggle in this story is between the government contractors and the Daemon, which is trying to organize people into small, self-sufficient communities. The idea is these independent communities make society as a whole less vulnerable to a large-scale collapse that can happen when we all depend on large corporations, large government, and large organizations of any type. It’s kind of like An Army of Davids, but it is all being manipulated behind the scenes by a computer program. For me that is the unsettling part of the story. Self-sufficiency is great, but how independent are people when they are being manipulated by a computer program. The downside to large companies and large government is the people at the top have to make decisions that affect the entire organization, but it is impossible for them to understand all the information they need to make good decisions. Here large government and large companies are being replaced with a large computer program, and I think the Daemon would have all the same problems a large organization would have. The story ends before we get a chance to see how successful (or not) this type of society would be. I hope Suarez is writing a third book in the series that picks up where Freedom(TM) ends. He has a good imagination, and I would like to see where he would take that. I just finished reading Daemon by Daniel Suarez, a story about a computer daemon (automatically running program) that wreaks havoc in the world. The book has a similar theme to Neal Stephenson’s Reamde: massively multi person role playing computer games that bleed over into the real world. Suarez’s story is not as wide ranging as Stephenson’s, and he focuses more on the video game aspects of the story. The other major difference is that in Reamde humans use computers to interact with each other while in Daemon, as you could guess from the title, one of the main characters is a computer program – a very powerful one. Since just about everything today has a computer chip in it and is networked, it is scary to think about something that can communicate directly with the “inanimate” devices around you and get them to do its bidding. Suarez has some imaginative, and sometimes horrific, ways this can happen. This story has lots of action and some interesting concepts to think about, but none of the characters have much depth and at the end you do not feel you know a lot about any of them. The daemon is a computer program, so you would not expect to know much about its motivation and character. It reveals its reason for being several times during the story, but always with the same few sentences. The human characters are the same. They are very stereotypical, and we never find out much about them. If the characters had more depth this would be an A+ story. It is a fast-paced thriller with some interesting concepts to think about, so I still recommend it. In fact, as soon as I finished it I ordered its sequel, Freedom(TM). I posted earlier about a break-in at my home over the holidays. A lot of electronics and flying gear were stolen, and I figured they were gone forever. However, I got a call from a detective at the Fort Worth police department over the weekend, and they have recovered some of my stolen items. They arrested two people on suspicion of burglary, and among the items they recovered from the suspects was a Swiss Gear briefcase with some USB flash drives in it. One of the drives had data from my flying club on it, so the detective called a flying club member listed in the one of the files to see if they knew anything about this. The person he called is no longer in the club, but he referred the detective to the current club president, who knew all about my burglarly and quickly figured out whose items the police had recovered. The detective called me and asked if I was missing a Swiss Gear briefcase and laptop, and if I was in the Six 4 A Six flying club. Of course, I was excited to hear they had recovered at least some of my stolen property. Then he began to describe the stolen laptop, a Sony Vaio asking for a login password for someone named Daugherty. Oops, that’s not me, and my stolen laptop was a Dell. Looks like they stuck someone else’s laptop in my bag. The good news is I can go claim my property after the police finish cataloging the recovered items, maybe as soon as today. From the detective’s descriptions over the phone it sounds like they found my briefcase with at least some of the items contained in it and my flight bag with the headsets that were in it. They may have more of my property, but I will have to visually inspect it to see what they have. No mention of the two computers, television and other items that were stolen. The other good news is that two people have been arrested for this. Don’t know if they were the ones that broke into my house or just intermediaries trying to sell stolen property, but either way I am glad they caught someone involved in this crime. Who knows, maybe now that they have someone in custody they can use them to track down more of the property. Flying from Fort Worth to Texas A&M for a basketball game combines two things I really enjoy: flying and watching Aggie sports. 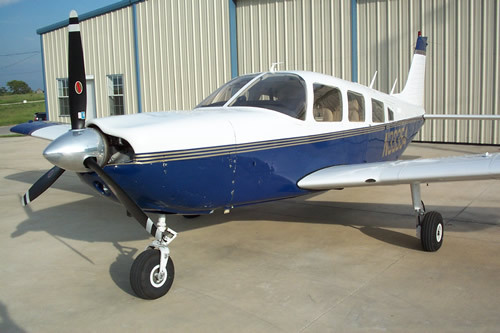 The weather last weekend was beautiful, one of the club’s planes was available, and A&M was playing Oklahoma State in basketball – an unbeatable combination. I invited a friend from work to go along and looked forward to a fun day. We got to the airport around 10am and began preflighting the Cherokee Six we would fly that day. Everything looked good except all the tires needed air. The friendly linemen at Atlantic Aviation quickly took care of that problem, and we were ready to go. We got in the plane and began running through the checklist: seat belts, avionics master off, prop full, mixture full lean, throttle open 1/4 inch, beacon on, master switch on, fuel pump on, advance mixture control… Wait a minute. Why won’t the mixture control budge? Try wiggling the mixture control a little. Nope. Nothing. Shut everything down. Try the mixture control again. Still nothing. Peer inside the throttle quadrant to see if something is jammed in there. Nothing. Take off the cowl and look inside the engine compartment. Nothing there either. We spent about an hour looking for the problem and could never find it, so we were not taking the Six on this trip. 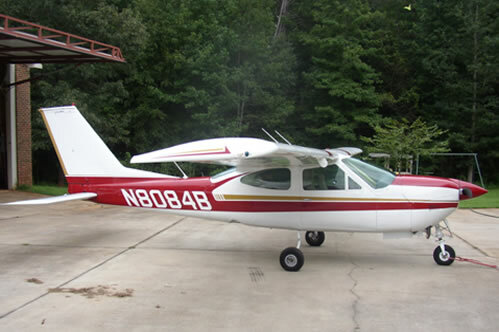 The other club plane, a Cessna Cardinal RG. was not available because two other club members were going to work on installing new plastic trim on its interior that day. They arrived at the airport as we were working on the stuck mixture on the Six, and when they saw we were not going to be able to take the Six they offered to postpone their work and let us take the Cardinal. Very generous. Soon we were on our way, still with plenty of time to have lunch with my daughter in College Station and make the basketball game on time. Things were looking up! The situation improved even more once we got up to cruising altitude. We had a 20 knot tailwind. That gave us a speed over the ground of about 150 knots (~170 mph). This is fun! As a bonus, it was a crystal clear day and the air was smooth. 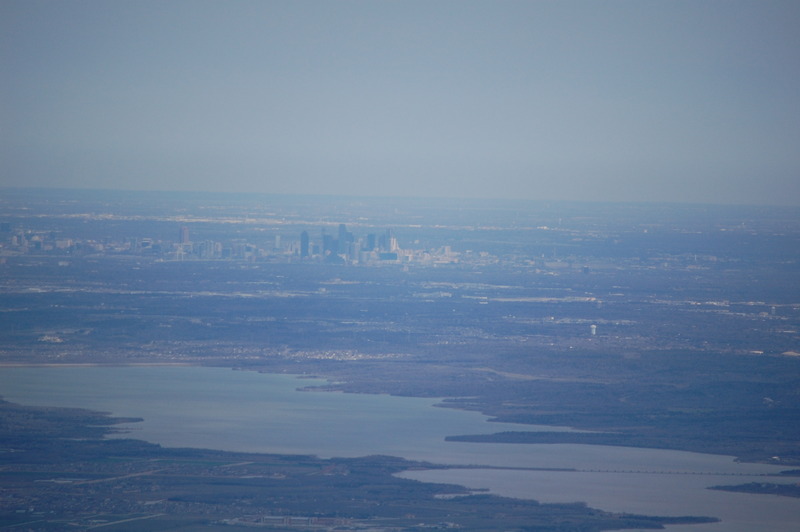 Dallas and Joe Pool Lake from about 50 miles away. 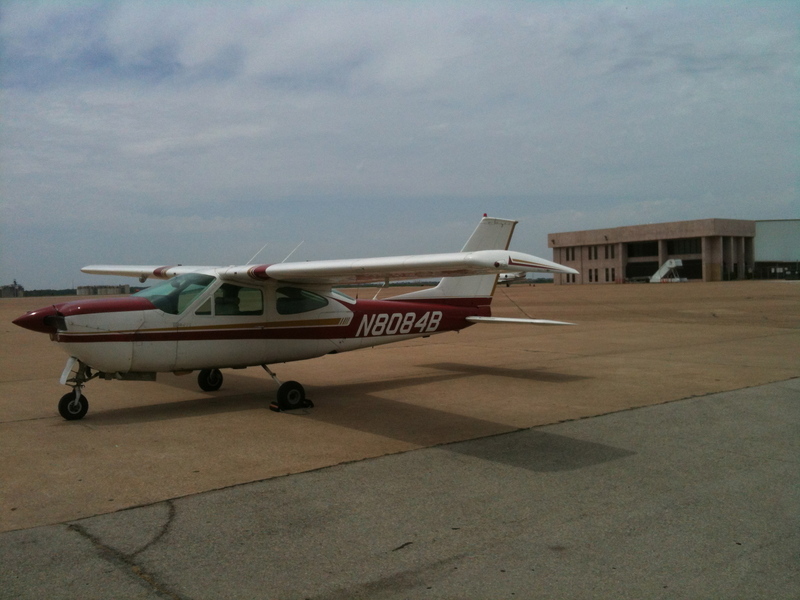 The flight down to College Station went well, and we were soon having lunch at Los Cucos Cafe. 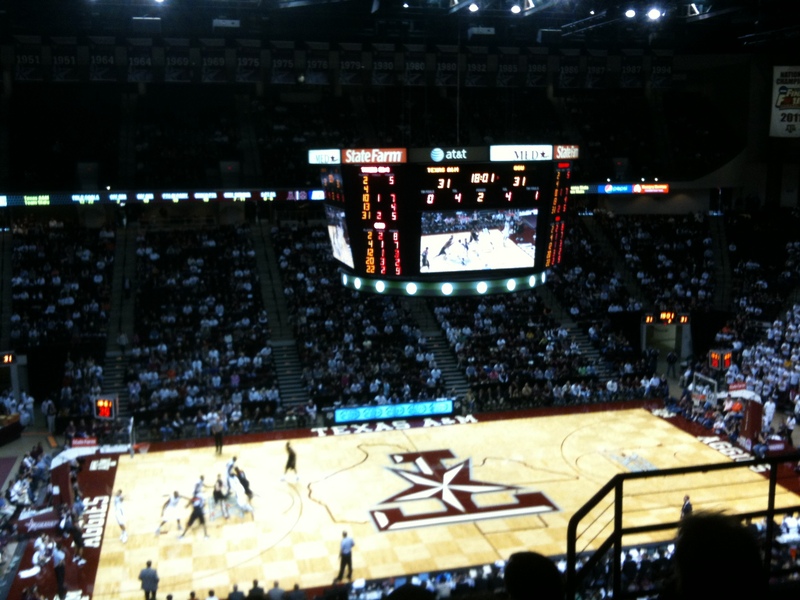 Then it was straight to Reed Arena for the basketball game. We sat down right before the national anthem started, and then watched an Aggie Big 12 win. The game stayed pretty close most of the way. After the game, we went straight to the airport to prepare for the flight home. Preflight, engine start and the taxi down to the end of runway 34 went fine. However, during our pre-takeoff engine run up, we discovered the left magneto was dead. As in, when you moved the ignition switch to the left magneto position, the engine would immediately quit firing as if the mixture had been pulled to the cut off position. I did it several times to make sure I was not imagining the symptoms. It was repeatable, so it was time to go back to the terminal and look for a mechanic. By this time, it was getting fairly late on a Saturday evening, and there were no mechanics around. Great. Stuck away from home with a broken airplane. Luckily, my daughter was nice enough to lend us her car, so we could drive home that evening. It’s a 3 hour drive, compared to a 1 hour flight. Not unbearable, but not as fun as flying. The only compensation was the we got to stop at Czech Stop in West for kolaches on the way home. Can’t do that in the airplane. I drove back to College Station on Sunday to get the plane to a mechanic first thing Monday morning. He checked the ignition switch, ground wire, and ignition wiring harness for problems, and they all checked out OK. That points toward the problem being the magneto itself, so it has been sent out for testing. That is where this story stands. The magneto is on its way to a shop for testing. I will post an update when I find out what the problem was. And even with all the problems (I left out the part where I got a speeding ticket on the drive home) it was still a fun day. Just not quite what I expected when the day began. The Dallas-Fort Worth area has received 4.27 inches of rain in the last 24 hours. That is a record 24-hour rainfall for the month of January, and it has caused record flooding as well. 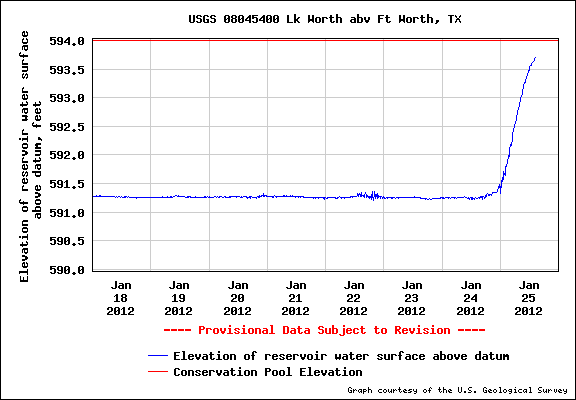 Lake Worth has been a few feet low all year, but it rose over 2 feet in the last 24 hours and it is still rising. At least the rate of increase in lake level is slowing as it approaches normal. I was out of town yesterday, recruiting at the Texas A&M Engineering Career Fair, and did not arrive home until late in the evening so while I knew it was raining I did not realize it had been that much and that the lake level was rising. So it was a bit of a surprise when I woke up this morning and looked out my back window to see — cormorants! Not just cormorants, but thousands of cormorants. The picture only shows about half the cormorants that were on the lake. They seemed agitated and were flying in circles and swimming rapidly in random directions. Then I noticed the lake level. You can see in the picture how the water has risen almost up to the bottom of the boat in its lift and how the jet ski is floating above its ramp. (It’s tied on the front, so it is not going anywhere.) It was still raining pretty hard and obvious that the lake was going to continue to rise so I immediately ran out and raised the boat farther above the water. The boat is not tied to its lift. It uses gravity to stay there, so if the water rose enough to float it off the lift it would drift away. That taken care of, I left for work. However, I did not want to leave the jet ski tethered and floating loose for too long since it could bang against the ramp supports and get damaged if it started floating completely clear of the ramp. 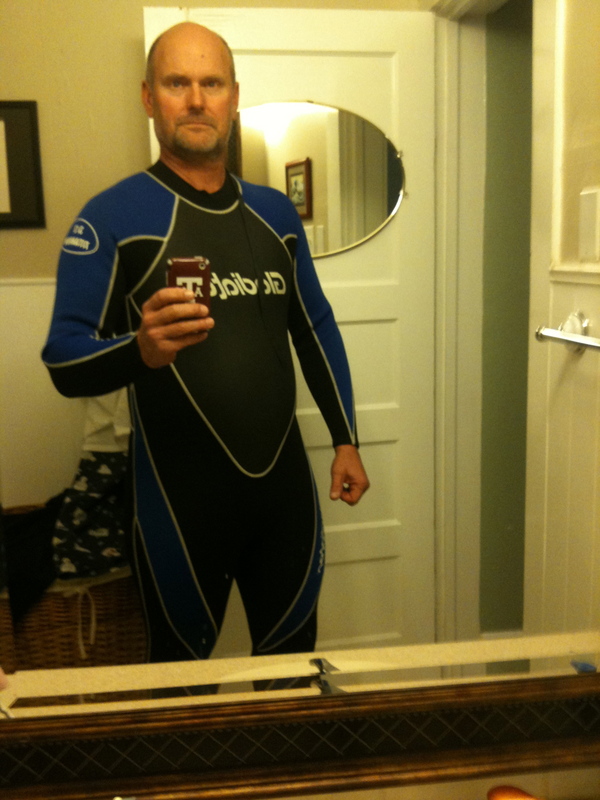 So when I got home today, I put on my wetsuit (glad it still fits! ), went in the water, and pushed the jet ski farther up the ramp where it would be more secure. Wet suits are good for skiing or for just working in the cold water. The lake temperature is about 51 degrees Farenheit, so the wet suit made being in the water a lot more comfortable. It only took a few minutes to get the jet ski adjusted. Then it was time to come back in the house and take a hot shower. 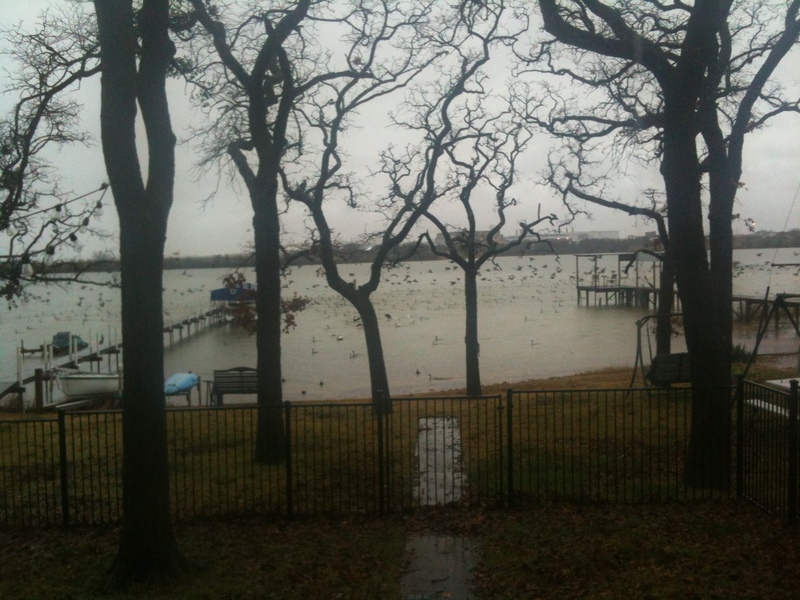 If the lake continues to rise the jet ski ramp could become completely submerged. I don’t think it will rise enough to do that, but now that lake levels are back to normal I need to move the jet ski ramp closer to shore. That is a multiple-person job. It will have to wait until the water warms up in the spring. In the meantime, the jet ski probably needs to come off the ramp and go on its trailer, safe and dry on shore. Sounds like a good job for this weekend.